From a private collection of early 20th Century dance costumes, this Temple Servant tunic from the ballet Le Dieu Bleu, performed by Diaghilev’s Ballet Russes, was designed by Leon Bakst. Required to go on loan for display, it was structurally weak from moth damage and had also suffered water damage and various unsympathetic alterations. The water damaged, printed hem border was locally cleaned to reduce the unsightly stains and then the holes were supported on dyed patches using stitching techniques. 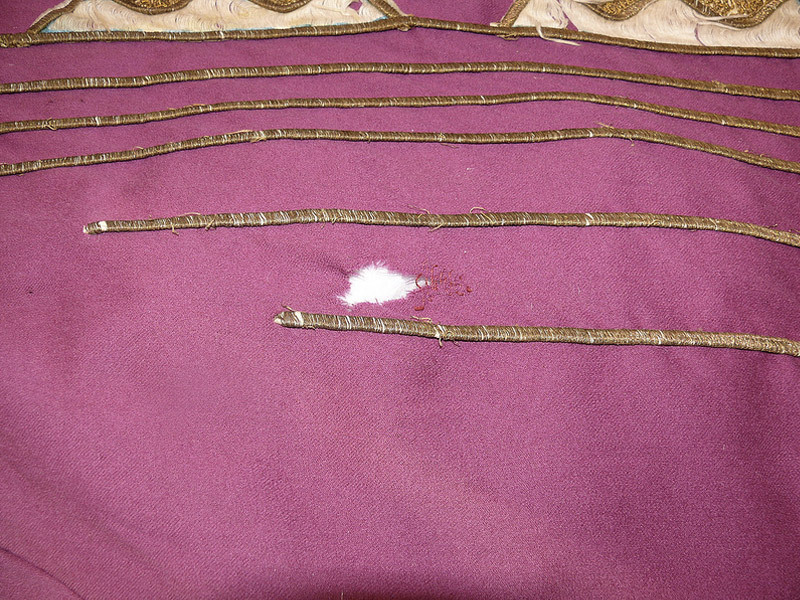 The entire costume was then given a full support of dyed fabric through which the damaged heavy braid decorations could be anchored and the extensive moth holes repaired with stitching. 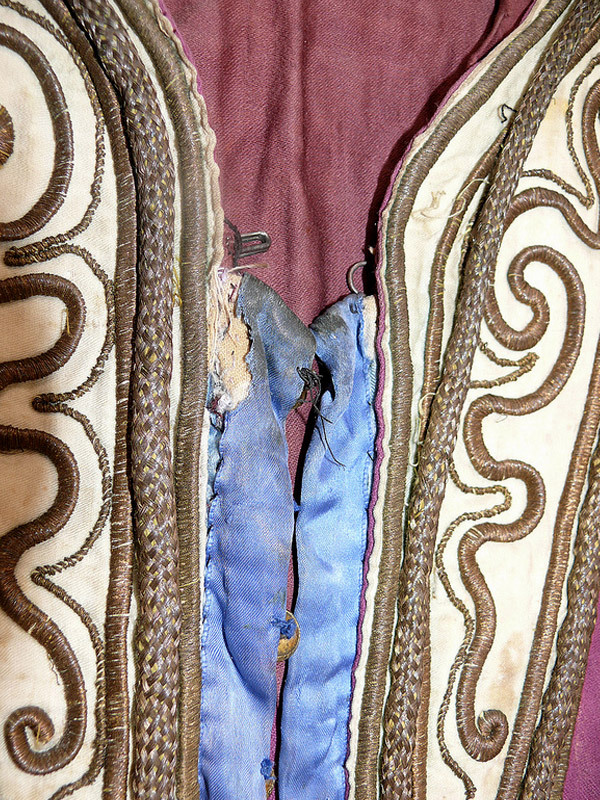 The bright blue edging to the neck opening was found to be made of a recently applied ribbon; this was removed to reveal fragments of the original turquoise silk beneath. New conservation silk was dyed to match the original and used as an overlay. The dramatic geometric patterned bands on the front and back of the robe were so badly damaged that their triangular design was obscured. 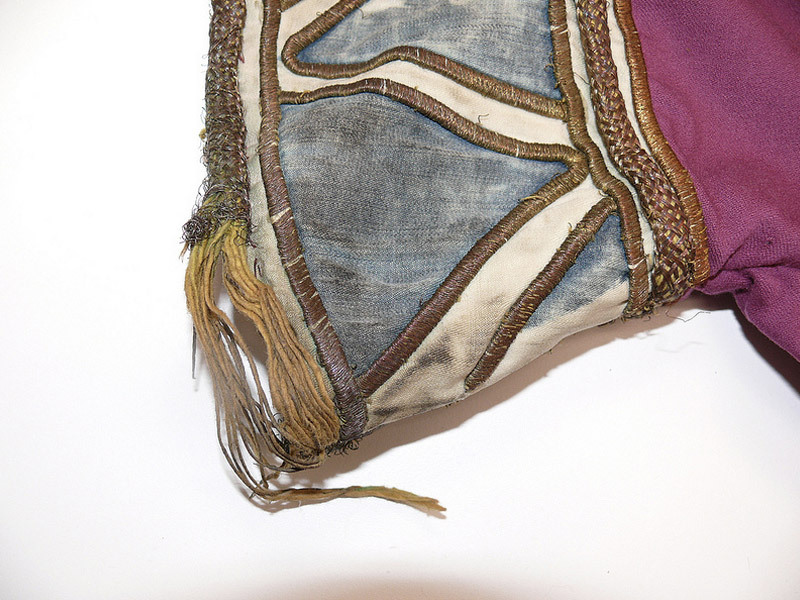 With reference to both the artist’s original designs and a Temple Servant costume from another collection, the decorative bands were re-printed using conservation dyes and applied to the costume.